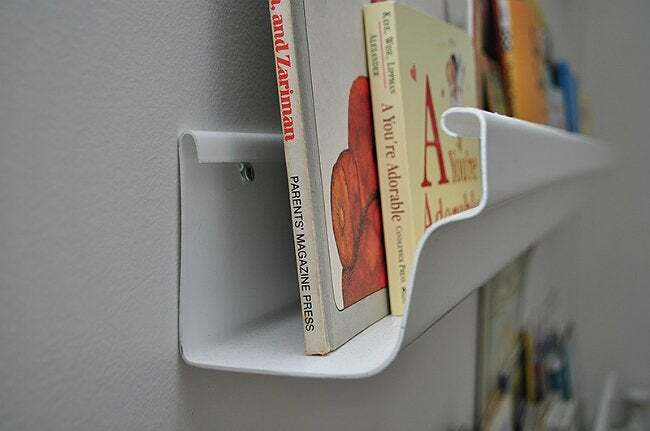 With a cheap hardware store staple and a handful of screws, you can mount your own DIY bookshelf on any wall in the home. As the first leaves begin to litter the lawn, we’re reminded that it’s once again time to dig out the ladder from the back of the garage. That’s right, homeowners: Gutter-cleaning season will soon be upon us! But gutters can be more than a source of unrelenting home maintenance guilt. As Liz, the DIY mind behind See-Saw, discovered, gutters can inspire some striking creativity. Just see how she brought this boring outdoor essential to new life as a unique wall-mounted organizer. 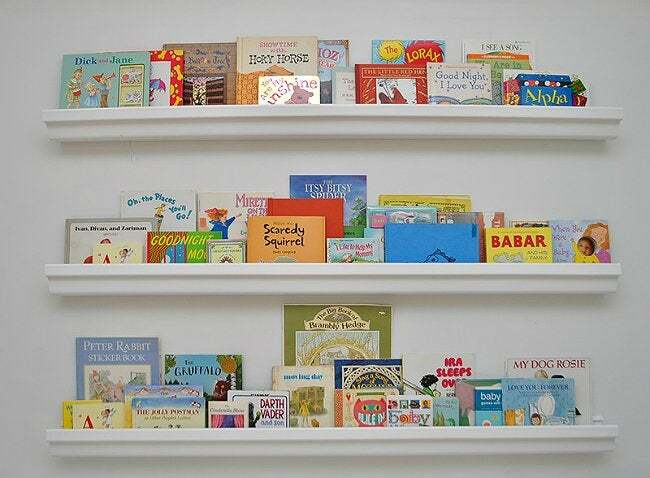 Looking for a way to add storage for her toddler, who had already amassed quite the collection of bedtime reads, Liz saw the potential in the gutter’s trough-like structure to serve as an attractive—and cheaper—alternative to shelving. Gutters are customizable in length, super affordable, and light enough to mount on the wall with just a few screws. Plus, the shallow channel that funnels water off your roof also tidily holds books face out, and the small lip keeps them from falling. This simple ledge is a perfect storage fix to mount on nearly any wall. It’s also wildly versatile, as useful for displaying framed artwork in the living room as it is keeping a cookbook open and safe from splatters in the kitchen. Want to make your own? First, grab a tape measure. Once you know the length you’d like your shelf to be, head to your local hardware store to pick up the gutter of your choice. If what you find is a bit longer than you need, you can ask an employee to cut it down to size, or you can cut it at home with a hacksaw. Use sandpaper to smooth down any rough edges, then screw the gutter to the wall. This DIY’s low cost is as big a draw as its practicality: One 10-foot vinyl rain gutter will cost you about $6. Even with a wall’s worth of shelving and a new pack of screws, that’s about as budget-friendly as it gets—so there’s no need to save this project for a rainy day!